You know the story, at least in outline: an outlaw mastermind leads a band of English gentry on perilous missions to save condemned French aristocrats from the guillotine during the period of the French Revolution known as The Terror. Though in this tale the duels are all fought with words and wits and not a single sword is drawn, it’s nonetheless an iconic swashbuckler, with a hero who holds to his own code of honor in the face of tyranny and death and in defiance of all the ordinary rules. The story bristles with suspense, betrayals, reversals, and deadly menace: the threat of violence is ever-present, but never quite erupts, though death hovers over every deceit. It’s masterly. And if that weren’t enough, it’s also a ravishing romance! The witty script is endlessly quotable, and the cast is perfection. The great Raymond Massey plays Citizen Chauvelin, the Pimpernel’s nemesis, with cold, reptilian malice and penetrating intelligence. Merle Oberon is pitch-perfect as Lady Blakeney, the former French actress whose heart is torn between conflicting loves and loyalties, but who in the end is as brave as the outlaw hero himself. 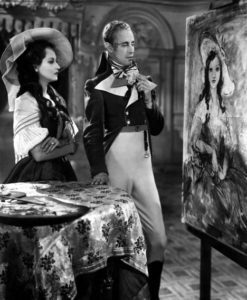 And where Leslie Howard is superb as the steely-eyed and indomitable Scarlet Pimpernel, he’s simply immortal in the rôle of the simpering, blithering, farcical fop with a cunning gleam in his eye, The Right Honorable Sir Percy Blakeney (Bart.). Sink me! It’s a triumph.